Whilst wash & vacuum systems have been around for a good couple of decades and provide a proven and “affordable” record cleaning system, the way to go with the best technology available today, but at a considerably greater equipment cost, is ultrasonic vinyl cleaning. Ultrasonic cleaning uses a process called “cavitation” – in which high-frequency sound waves create cavitation bubbles in a liquid bath of water and surfactant. The cavitation bubbles produce high forces that clean vinyl in a powerful but minimally abrasive manner, penetrating cracks and recesses. Removable contaminants include dust, dirt, oil, grease, fungus, and mould release. It is perfect for vinyl because it requires zero contact with the record and gets deep into the grooves. Two “popular” models are from Audiodesk (my choice) and Klaudio. (The Audiodesk is half the Klaudio price, but still a significant investment) The original Audiodesk ultrasonic cleaner was launched around five years ago, simply as a cavitation machine, at nearly twice the price. The “Pro” has had five years of development, adding improvements to the cleaning cycle. Great attention has been paid to the build quality of internal parts, as befits a product of this price range. To watch a record being cleaned ultrasonically (beats watching paint dry, just not much), shot here in 1080p HD with sound at LJC Makeshift Studios in London, uploaded to YouTube. 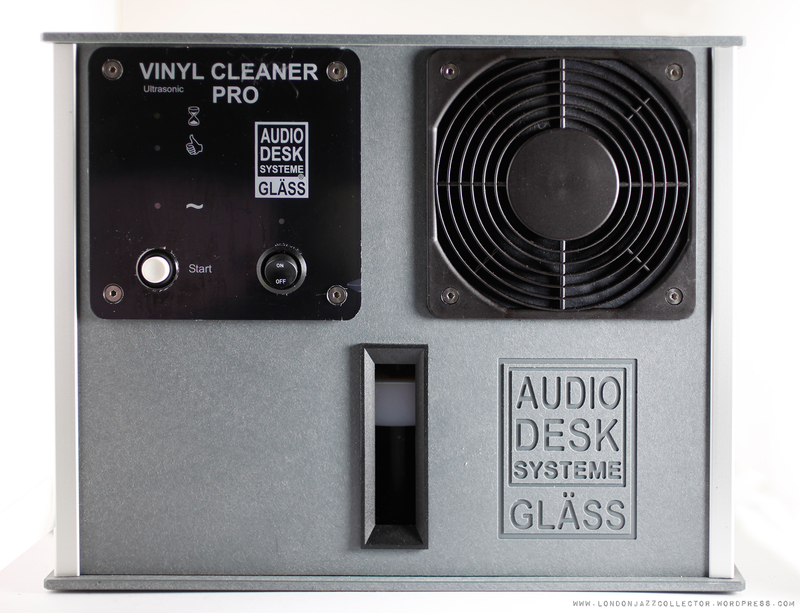 Audiodesk Pro Ultrasonic record cleaning machine, full basic cycle six minutes. Hear your vinyl in the cleanest condition currently possible, the only harm it can do is to your piggy bank. The A/D Pro is a bit over £2k, so it is not for everyone, but I consider it well worth the expense. First, I’ll tell you why. In vinyl-based hi-fi there is an information “chain of command”, running from the source – the vinyl groove wall, through stages of signal amplification, to the final sound from the speakers. It is axiomatic that any weakness in the chain leads merely to amplification of that weakness further down the chain, for example amplifying a “muddy signal”, so the biggest investment should be in things closest to the source, not the other end – the speakers. Speakers basically do as they are told, but because that is where the sound comes from, popular superstition has lead many to think improving speakers improves sound. (When you have done everything else, possibly the speakers matter) . The signal source is the point of contact between the stylus and the vinyl groove wall. Any improvement in that point of contact and the removal of any possible interference ensures the signal (music) has the best possible start in life before it heads off through the chain of amplification, to emerge at its final destination – your ears. The magnitude of impairment cause is important. The smallest discernable change in sound at the groove wall/ stylus interface is one thousandth of the thickness of a human hair. The idea I have heard from otherwise sensible people that you need to “lubricate the groove” (car engine is the wrong model) In practice anything in that vinyl groove – dust, dirt, finger-oils, cigarette smoke deposit, mould-release, or “lubricant” – impairs contact, creates “false information” for the stylus, which is why you want the groove as clean as possible. Cleaning is what cavitation does better than any other method, though at a price. The basic six minute cleaning cycle (which can be increased incrementally from six minutes to ten) starts with the water in the lower reservoir being pumped up into the upper chamber in which the vinyl sits, filling up to just short of the label. The vinyl then gets about five rotations in the bath with the vinyl surface agitated between two offset pairs of fluffy rollers. This is followed by five rotations applying ultrasonic cavitation – blasting the grooves with powerful jets of air bubbles. All this time, the cleaning fluid in the upper chamber is circulated through a large spongy filter back into the lower chamber, before circulating back into the upper chamber. To finish, the record is given slow rotation with an air dryer. Vinyl emerges static free and dry, ready to play. All parts such as filters, rollers and wiper blades are user-replaceable. Filling the tank requires 4.5 litres of purified water (5 litres around £6 from chemists) and a small bottle of surfactant (proprietary liquid, £12 a pop, use of anything else invalidates the guarantee). This mix is good to clean 100-150 records, before emptying out and refilling, which is easily done into a sink, as the machine is not intrinsically heavy. Consumable water/surfactant cost is around 15 pence a record, and the capital cost of the machine is about £1 a record to someone with a 2,000 record collection. With vintage collectable vinyl typically £50 a record, not uncommonly over £100, up to £5,000 for the most desirable titles, it is for you to decide if the range 0.2% to 2% of record cost is a good investment in improved listening pleasure. Ultrasonic cleaning goes much further than merely reducing avoidable surface noise (which it does). If that was all it did, I would not be convinced it represents value for money over other much cheaper methods of cleaning. Ultrasonic cleaning does something previous methods I have used have never done – improving audible sound quality. This pitches an ultrasonic cleaner into the arena of component and infrastructure equipment, where I believe it punches above its weight in cost/benefit equation. Because of the danger of confirmation bias, A:B listening tests were conducted with an objective listening buddy, who had no investment in the machine. An afternoon was spent play-testing a variety of records – one never before cleaned, one twice cleaned with vacuum/alcohol cleaner, records known to have lots of surface noise, brand new vinyl, 20 year-old vinyl, 60 year old vinyl. Result? Every record sounded much improved comparing before and after ultrasonic cleaning. Not only further reduction in surface noise, but audible improvement in sound quality – lowered bass floor, more articulate mid-band and detail in highest frequencies. You can see the difference in dust in a photo, but can you hear the musical difference on a rip? I know, because I can hear the difference on a revealing hifi system. I am not convinced the step-improvement is audible on mp3 streaming through PC speakers. If it was, everything spent on people’s hi-fi systems is worthless, might as well listen to everything on your phone through Spotify. I don’t go there. There is no doubt ultrasonic cleaning does something that convention alcohol/ bath and vacuum cleaning does not do. That could be superior penetration to the very bottom of the groove, more effective removal of residual mould release, or just stuff welded in the groove that more aggressive cavitation shifts. I was surprised how much improvement occurred with background crackle, though not expected to be eliminated entirely. It is not just “a record cleaning machine”, it is a hifi component, just as important as your amp or cartridge. If you think of spending £2k on an improved amplifier, high-end cables, or indeed on one rare record, you begin to see the Ultrasonic cleaner in proper perspective. An ultrasonic machine is, I believe, an essential lifestyle accessory for a collector of vintage vinyl who has had most if not all his basic needs in life met, and is able to justify spoiling themselves with this beautiful and most effective record cleaning machine. The initial cost is not for the faint-hearted, but the results in my opinion justify it. Whether it is worth it to you depends very much on where you are in the epic journey to Vinyl Valhalla. I’m sailing through those gates right now, and the sky is blazing!